This Week in Geek: iPad-Free Edition! 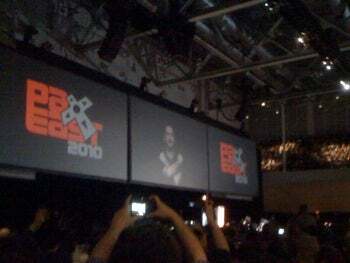 This weekend I had the extreme pleasure of attending the very first annual PAX East gaming convention in Boston. For those of you that don’t know, PAX is the Penny Arcade Expo, a tradition started in Washington state in 2004 by Jerry Holkins and Mike Krahulik, makers of the popular Penny Arcade web comic. On Friday afternoon, I stood in the massive queue to enter the Hynes Convention Center in downtown Boston and it was, without a doubt, the most fun I’ve ever had standing in line. Giant projection screens placed throughout the room toggled between a “Messy Board,” a message board of sorts you could post to via text message, and a fun little voting/trivia game. Then, suddenly the screens turned to an interactive platformer game in which the thousands of people in line could collectively lean to one side or the other to control a character and get powerups. 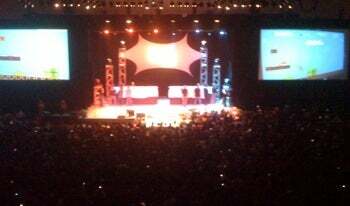 Seeing an entire convention hall worth of people furiously leaning back and forth with their arms in the air was surreal but only the tip of a really fun iceberg. The exhibitor hall, as with any convention, was a veritable cornucopia of software previews, new gadgets, product announcements, and of course, more swag than you could shake a stick at. Some of the GeekTech worthy highlights include: OpenChord- a mod to turn your actual guitar into a Rock Band/Guitar Hero game controller; Immerz KOR-fx- a haptic force feedback device that works with any 3.5mm audio signal; and of course, the NVIDIA GeForce GTX480 powerhouse, announced officially at PAX East. I also got to experience first hand, a number of soon-to-be-released, awesome-looking games, such as 2K Games’ highly anticipated Mafia II, Rockstar’s new GTA-on-a-horse Red Dead Redemption, and a personal favorite- EA’s skate3. Indie games, particularly those for Xbox LIVE Arcade, were a surprisingly large presence at the expo hall as well. So many great ones, in fact, that I may save that for another post. 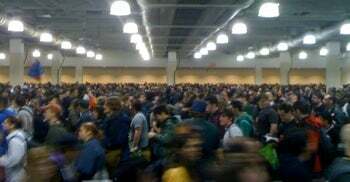 Beyond the expo hall was really where the heart and soul of PAX East resided. Everyday until the close of the convention (2am on Friday and Saturday), meeting rooms were dedicated to freeplay and tournaments of all kinds- from console gaming to PC, from tabletop to handheld; there was even a dedicated Rock Band Lounge where of-age attendees could kick back, enjoy a beer, and have their hand at their favorite Iron Maiden song. The closing ceremonies of PAX East were unlike any other convention’s I’ve attended, opting not for the typical speech format but for the final round of the Omegathon: a unique videogame tournament spanning all three days in which randomly chosen contestants competed with a randomly chosen partner to play games they didn’t know they were playing in advance. Similar in structure to the famous Nintendo World Championship of 1990, the four finalist contestants, aka Omeganauts, played as a tag team to complete specific goals in four different NES classics: 50 coins in Super Mario Bros., 1500 points in Rad Racer, 10 lines in Tetris, and finally a race to beat the first boss of Contra. The entire main hall was packed with attendees of the convention- never have I heard so many people scream in agony seeing Mario get killed by a Koopa Troopa. Towards the end of the heated competition, my girlfriend whom I had attended the con with, and former Omeganaut herself, turned to me and said, “This is my SuperBowl.” That’s when I remembered the words of Wil Wheaton… and I knew I was home.